Mary & Charli … Ready To Power Up! 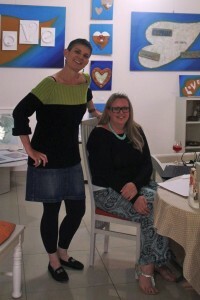 On May 15th 2015 I ran my first Twitter workshop in conjunction with the popular networking group Mary’s World in Limassol. Ten Twitter Power Hacks was an interactive presentation designed to give insights into the best ways to boost followers,leads and interaction whilst also having a great time on Twitter. Learning To Tweet Your Heart Out, an article in Cyprus based newspaper “In-Cyprus” promoted the event as a challenge to those who wanted to learn to tweet but didn’t know where to start. With students attending from various social media backgrounds and abilities we soon got talking about aims and objectives. For some, Twitter is simply a subject of curiosity or a hobby whilst others wanted to use it to promote their brand or business venture. Throughout the evening we talked hashtags, interaction, influencers and how to increase followers which resulted in some excellent questions and discussions. Of course, the event was made complete by the addition of some fabulous food and drink and of course great company! The most satisfying part for me, was receiving tweets from the students after the event and realising that they are now inspired to try out the new techniques… YAY! My presentation Ten Twitter Power Hacks is available to view online HERE and I want to thank everyone who attended and of course Mary’s World for organising. So I ran my first Twitter workshop and it was awesome! We feel inspired to run another social media event, what do you think? Tweet me @charli_says and let me know.